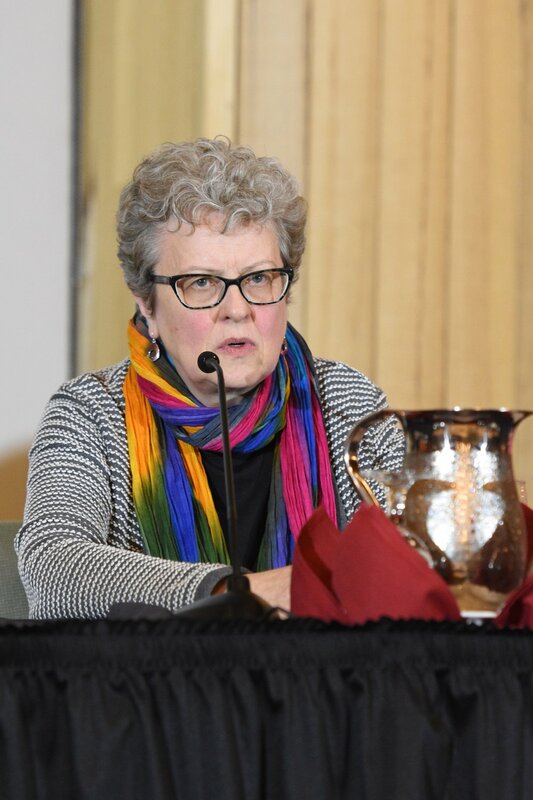 Communications professor Erica Salkin argues at the President’s Colloquy on Civil Discourse that free speech should be spoken and listened to, April 16, 2018. Kathy Lee recounts her experiences as a student with civil discourse at China’s Tiananmen Square incident in 1989 at the Colloquy, April 16. Communications professor Mike Ingram discusses the need for polite civil discourse on both sides of the political spectrum, liberal and conservative, at the President’s Colloquy on Civil Discourse, April 16. Theology professor Will Kynes discusses the foundations of civil discourse in the U.S., mentioning figures such as Rhode Island state founder Roger Williams at the President’s Colloquy on Civil Discourse, April 16. The panelists at the third President's Colloquy for Civil Discourse.